Nancy Paterson (1997). Technology ≠ Art. One consequence of the recent proliferation of new electronic technologies is the erosion of philosophical distinctions between the body and the brain that dominated scientific and philosophical thought for most of the nineteenth and twentieth centuries. As the Cartesian body/mind split between physical/biological and rational/intellectual processes is challenged, the debate which distinguishes between chemical processes in the brain and more abstract mental operations such as metacognition and creativity is also in a state of flux. New electronic media compel us to re-think the body's relationship to technology. The body is far from absent in the discussion of the political, economic and cultural impact of interactive media such as virtual reality technologies and their application. But whose (generic) body are we talking about? Issues of representation, access and diversity of cultural experience are undermined attributes of our bodies in these debates. The experience of interaction in a computer-generated environment, a definitive paradigm of VR, was inaugurated in the early 1960s when Ivan Sutherland, working out of the University of Utah, developed a head-mounted display that allowed the user to look around a virtual landscape. Two small cathode ray tubes driven by vector graphics generators provided the appropriate stereo view for each eye. In the early 1970s, Fred Brooks at the University of North Carolina created a system for handling graphic objects using a mechanical manipulator. Around the same time, Myron Krueger began experimenting with interactive environments for unencumbered, full body, multisensory participation in computer generated events. The intense (although not widespread) excitement inspired by such experiments was accompanied by confusion and a sense of unease. Not since the Industrial Revolution had new technologies so directly challenged our sense of physical being as well as consciousness. Perhaps discussions around the "disappearance" of the body have taken our attention when we should be thinking about the disappearance or nonexistence of critical and aesthetic discourse in the field of new media art itself. An appropriate question is whether artists have missed the critical moment in the development of these new media when these issues might have been raised. Have we missed the boat entirely? For many years, the economics and politics of technological research and design have dictated the type of work being done in these fields. Aesthetic considerations and questions about content have taken a back seat to concentration on performance improvements in personal computers and the development of low cost yet powerful 3-D rendering engines. The need for support (primarily funding) has meant that the applications chosen for development reflect the influence of the U.S. military, which invested heavily in the potential of these media for battlefield simulations and training. In the subterranean world with rocks, roots and underground stream. Photo courtesy of the artist and Softimage. As a case in point, the Architecture Machine Group at the Massachusetts Institute of Technology produced the revolutionary "Aspen Movie Map" in 1978-79, funded by the U.S. military's "Defense Advanced Research Projects Agency" (DARPA). Numerous artists participated in this and related projects—their justification being that they could not otherwise afford or gain access to the expensive, high-end tools of the trade. Many individuals who benefited from the military funding for such projects went on to become permanent fixtures of the new media art scene, receiving sponsorships at media arts organizations in the U.S., Germany and Canada for projects showcasing the latest in VR and other new electronic technologies. Drawing on her background in theatre, Brenda Laurel describes the central controversy in VR as "the question of whether virtual worlds and the experiences people may have in them are or are not designed." If we forgo involvement in system design, allowing our experience of virtual worlds to be limited to systems designed for us, what responsibility are we willing or able to undertake for the types of experiences triggered by these systems? It is no coincidence that the first Canadian "Playdium" opened by Sega is in a suburban mega-mall, thirty minutes by car outside of Toronto. Anyone looking for a quick, cheap (video) thrill can find satisfaction on the Yonge St. strip. But for those who can afford a more substantial investment of both time and money, more intense (virtual) pleasures await at the "Playdium." It offers an opportunity to experience the twenty-first century body hard-wired and in an intimate relationship with technology—in a context designed by and for a very specific sector of the population. The bodies it speaks to and about are white, Western and mostly male, reinforcing the debt owed by the designers of VR to capitalist and military mentors. Notable as exceptions are the VR artworks of Char Davies and Brenda Laurel. Although these women are working from positions of privilege within the software industry, they must be credited with having taken the first tentative steps toward addressing a n aesthetic that has been otherwise dominated by consumerism and militarism. 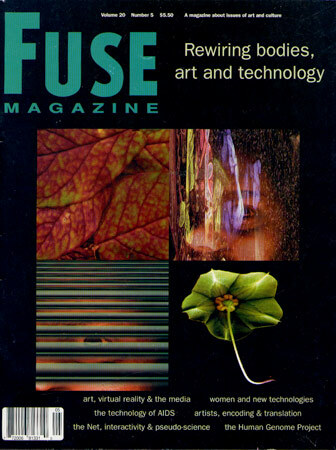 Char Davies, a principle in SoftImage (Montreal) prior to its purchase by Microsoft, created Osmose which she proposes as representing an alternative aesthetic for VR—one that encourages reflection and contemplation as well as a profound awareness of the body. This work is experienced in solitude. The immersant can explore several interconnected worlds, but cannot touch or change them. Translucency, subtlety of texture and spatial ambiguity describe the objects and environments that are encountered. There is no goal or mission in Osmose. Wearing a head-mounted display and a vest that monitors breathing, the immersant navigates through lush and abstract landscapes, utilizing the underwater breathing and leaning techniques of scuba diving. Encouraged to let go of habitual perceptions of space, the immersant must re-experience the body and its relationship to the world. Brenda Laurel of Interval Research recently started a company called Purple Moon that designs software specifically for girls and young women. It is one of a handful of companies that are considering women's needs, as compared to the many hundreds of thousands that are designing software for an adolescent, male audience. Laurel's work at Interval Corp. and Purple Moon has placed her, like Davies, in a position to challenge (at least) the gender bias that has dominated VR design and development. In residence at the Banff Centre in 1993, Laurel designed a VR work with Rachel Strickland titled Placeholder. In this work, unlike Osmose, multiple users interact with each other as they explore, separately and together, several "worlds" that are connected by portals. Each participant is originally assigned a pictographic representation of an animal, for example, "snake," "crow" and "spider." This is how they are seen by the other participants. These "costumes" lend certain powers to the wearer, but also certain limitations that quickly become apparent. "Costumes" may be exchanged or discarded, and so the participants are empowered to choose the body in which they are most comfortable. The interaction between people (and animals), the places that they choose to inhabit, and the way that this relationship is described and manifested ("the places here are marked with many voices") is the focus of this work. Both Osmose and Placeholder are exceptional media works that attempt to contribute to the development of a critical aesthetic in this field. Artists experience the same challenges as the rest of the population in gaining access to new technologies and maintaining a competitive level of media literacy. However, simply putting new electronic technologies in the reach and hands of artists does not equal art. Whatever our class, race or gender, we all take our bodies with us as we approach the millennium. We can only buy so much technological confidence. The rest must come from art and artists like Davies and Laurel who critically envision a creative future in which we all take part. 1. Randal Walser, "Elements of a Cyberspace Playhouse" in Virtual Reality: Theory, Practice and Promise, ed. Sandra K. Helsel and Judith Paris Roth (Westport, Connecticut: Meckler, 1991), p. 53. 2. Brenda Laurel, "Virtual Reality Design: A Personal View" in Virtual Reality: Theory, Practice and Promise, op. cit., p. 95. Nancy Paterson is currently Associate Artist at the Bell Centre for Creative Communications, an Instructor at the Ontario College of Art & Design, and Facilities Manager at Charles Street Video.